Attribution: Gua Sha in Chinese. Dec 2017 by White whirlwind, Wikimedia. For more information, click on the green-blue words. In the article titled Natural Methods to Smooth Forehead Muscles for Results that Look and Feel Amazing, I wrote about Do-It-Yourself (DIY) practices to naturally smooth the forehead. I continue to practice the methods described in that article while also making new habits. I still unconsciously furrow my brow when I concentrate and crease my forehead with worry but am getting better at releasing forehead muscle tension as I turn this effort into a mindfulness practice. After decades of neurons, electrical messages, nerves, muscles, and fascia working together to furrow and crease my forehead skin, these skin-wrinkling co-workers now collaborate at every subconscious opportunity to furrow/crease my forehead with no conscious input from me. To convert the current furrow/crease muscle memory into a naturally relaxed state, Frownies may be used to hold forehead muscles smooth while sleeping. This helps to create new habits and forehead muscle memories over time. Relaxed, smooth forehead fascia and muscles promote a feeling of calm. 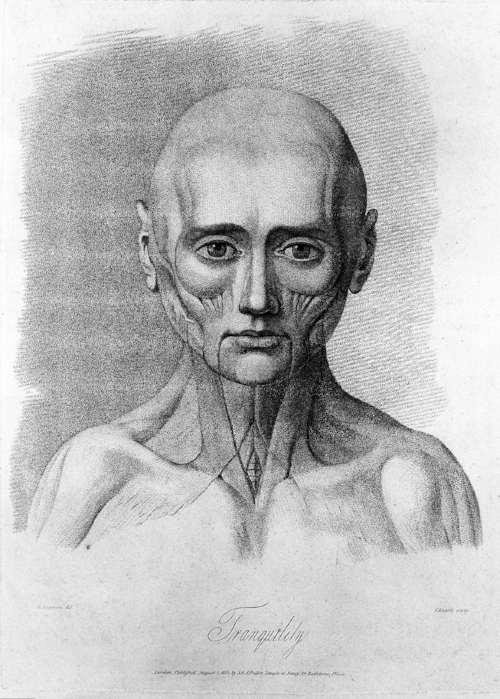 Sketch showing facial muscles in a relaxed state. One important forehead smoothing habit includes use of small massage therapy tools to release fascia and muscle tension. Fascia is located between the skin and the muscles, encasing the muscles. If fascia is tight, it is difficult to release the underlying muscle. I purchased this stainless steel Gua Sha tool several months ago not knowing what it was or how to use it. I’ve embraced DIY trigger point therapy to the extent that I now purchase select devices that may be used to increase circulation; break up painful muscle trigger points; and stretch, smooth and scrape the skin and fascia to stimulate intense circulation. Recently and a few days after I had completed a dermaroll facial using the Derminator 2, I was a little puffy. I used the Gua Sha to smooth facial skin, fascia and muscles, and noticed that the scraping action visibly moved facial lymphatic fluids and instantly smoothed puffiness. I googled Gua Sha, found it to be trending, and as I had personally discovered, the tool is crazy good at stimulating lymphatic flow. The lymphatic system removes and transports waste from the blood however it does not have it’s own pump system to promote that circulation. Instead, physical movement and stretching must be used to stimulate lymphatic flow. Exercise, massage, and use of practices including dry brushing and Gua Sha are beneficial in promoting lymphatic flow. The Gua Sha tool is easy to use and provides many benefits. Increased circulation brings oxygen and nutrients to the skin, fascia, and muscles while promoting waste elimination via the lymphatic system. This results in decreased puffiness and glowing skin. A brief search for articles about fascia and muscle indentations beneath deep facial lines and wrinkles showed that there is not much information available about this topic. One study looked at skin ligaments (retinacula cutis) that extend from the deep surface of the dermis to the underlying deep fascia. Skin ligaments are present in subcutaneous facial tissue and connect the dermis and underlying deep fascia. Skin ligaments provide structural support to the overlying skin. The study found that the frequency and depth of wrinkles was greater in areas where the subcutaneous layer is thin and there is a low density of skin ligaments. I had never read about the Gua Sha method until I wrote this article. After purchasing a stainless steel Gua Sha, a Physical Therapist had showed me how to use it. I always keep the tool nearby because it provides almost instant relief from pain caused by tight fascia and muscles. For the body, I was instructed to scrape the Gua Sha at an angle to the skin surface repeatedly and strongly until the skin turns pink showing that the underlying tissue is stimulated. The Gua Sha method is described here. This image shows the results of an intense Gua Sha body treatment. On the face, the Gua Sha is used in the same manner but with a gentler approach as described in this article. 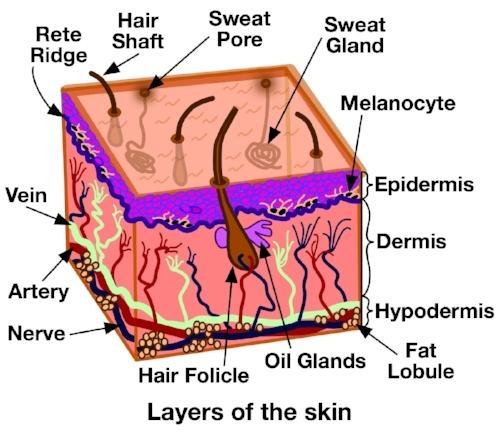 Depending on the depth of facial skin wrinkles, skin remodeling may not be enough to promote smooth skin. Fascia tissue and muscle remodeling may be used to remove indentations, knots, and tightness over time. Replace conventional un-natural treatments and skip the office visits, injections, and costs with a few DIY deep facial tissue manipulations plus a mindfulness practice to naturally soften gracefully evolving you.